September | 2013 | Real Art Is Better! The owner of Snow Goose Restaurant and Sleeping Lady Brewing Company decided to have a mural on the North wall of the building on 3rd Avenue, and the manager contacted me because in the brewing community in Anchorage I’m known as the “beer artist”, so naturally he thought I was the obvious choice. 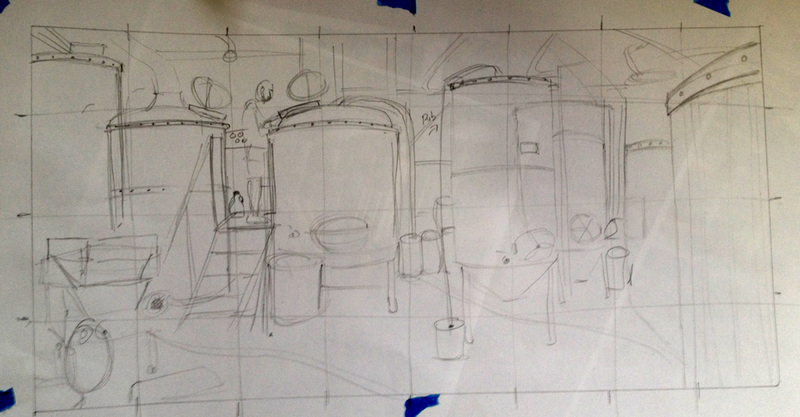 I am really excited about an opportunity to paint on such a large scale. This will be the largest painting I’ve ever made by far! The first thing I did was research how one goes about making and selling someone on a mural concept. I learned that a detailed proposal is not included in the original bid, because a proposal takes so much time and energy to complete. Once the bid is approved, the proposal is a paid part of the process of creating the mural. I prepared a bid packet with three preliminary image concepts along with a budget and met with the owner to make the hard sell. To my delight, he chose the design that I preferred and gave me the go-ahead to create the mural proposal. The concept is a depiction of the inside of the brewery, which has gorgeous copper kettles. I want to show all aspects of the brewing process, which is difficult because all the steps don’t happen in one place in the brewery. The ability to show more than one can photograph is one of the interesting aspects of painting. So I am working from many photos I took early one morning at 6:30 AM while the brewers were brewing a batch of Fish On! IPA -one of my favorite brews. I printed the best photos and laid them out all over my studio and made a compositional sketch. 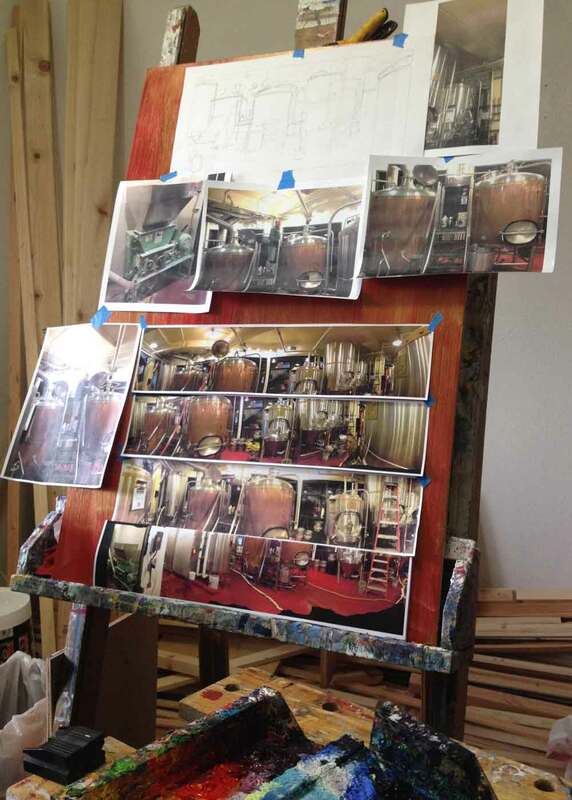 I then made a small oil painting study of the brewery. Now I am making a larger study, and when it’s finished I will make a mock-up image in Photoshop to show what it will look like on the wall. Stay tuned to see the photos of that mock up. Photos of the brewery compiled. Preliminary sketch of the small painting study. This entry was posted in Beer Paintings and tagged anchorage brewery, Anchorage mural, Brewery, brewery mural, Brewing, Mural, scott clendaniel, Snow Goose on September 27, 2013 by realartisbetter.